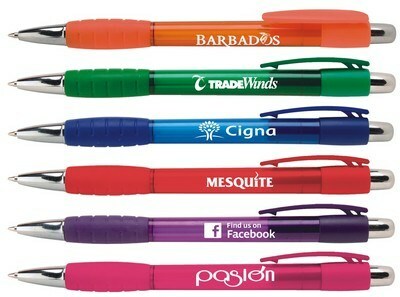 Custom branded promotional pens are everywhere and for good reason. A personalized writing instrument is a cost effective, useful marketing tool for businesses to grow brand recognition and act as an advertising tool that always comes in handy. Audience and Purpose: Before committing to a promotional pen, consider your audience and purpose. Are you trying to just to get your name out there? If so, plastic pens bought in bulk might do the job. Wanting to make a professional impression at a seminar? Higher-end metallic pens give off a sleek, pulled-together look. 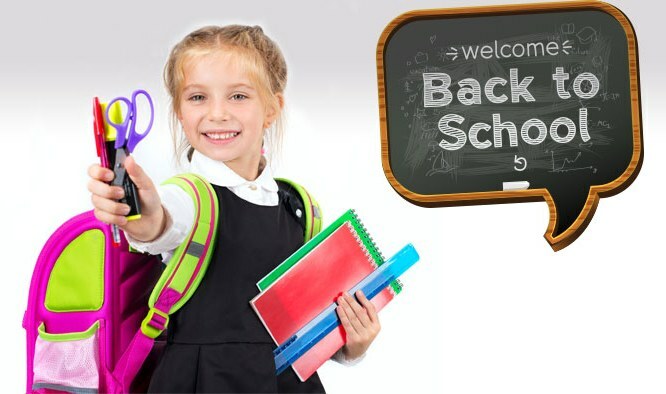 First Impressions Count: The look, color(s), and size of your promotional message should be well thought-out, as should the specific pen type. 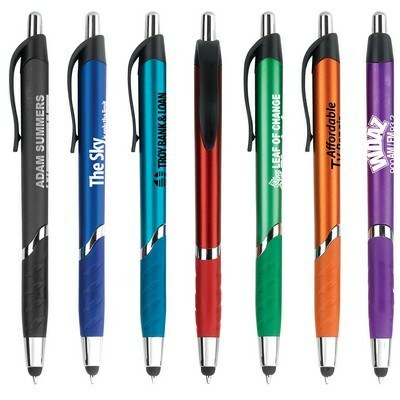 Your Promotional Pen should reinforce the brand you are seeking to promote. For example, a high-end boutique law firm would steer away from basic plastic pens and promote their firm’s high-quality service through a classic, sophisticated polished metal pen like the Crown Collection 54 Metal Pen. Be You: Likely the most important factor to consider when choosing a promotional pen is how the pen will represent your business. The ideal Promotional Pen isn’t limited to just making a first impression. It should function by making an impression and letting everyone know what your business is about. If you’re a fun company that wants to attract unusual and exciting clients, you might consider a novelty pen like our Phat Swanky Pen or the Custom Logo Voyager 3-in-1 Multi Ink Color Pen. Still don’t believe that a custom branded pen can represent your company? 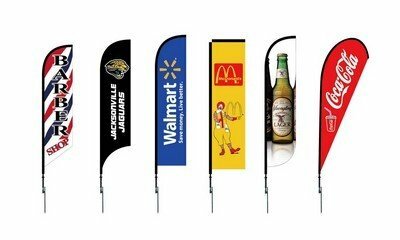 Read on to see how successful businesses have conveyed their brand through promotional merchandising. Global Delivery Network and the BIC Grip Roller: Global Delivery Network’s (GDN) branded BIC Grip Roller is an excellent example of a company conveying their brand through strategic promotional merchandising. Through their selection of a durable, smooth-writing pen, GDN conveys their dependable and simple process of parcel delivery. Shoptalk and the Jada Matte Stylus Ballpoint Pen: Shoptalk, a large scale, cutting edge ecommerce conference, made a strategic choice to represent their event with a pen like the Jada Matte Stylus. This technology inspired device pen with touch-screen Stylus embodies Shoptalk’s tech forward approach, while the pens sleek matte body conveys a stylish, up-to-date image. 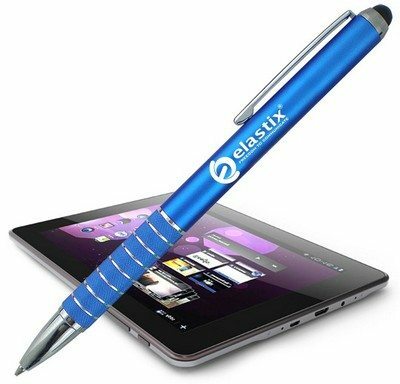 SkyBox Checkout and the Custom Logo Blair Retractable Pen w/Stylus: SkyBox Checkout, a service platform that helps ecommerce sites reach international markets, chose the Empire Jada Stylus – and with good reason. This multipurpose, classic stylus pen is perfect to represent a multipurpose, international company. 71lbs and the Zigzag Click Pen: A forward-thinking company intent on saving companies money, 71 Lbs. picked an affordable and functional promo pen similar to the Zigzag Click. With its comfortable rubber grip and curved shirt clip, it’s an easy to use, quick and efficient logo writing utensil that spotlights the brand. Shipsurance and the Wanda Stylus with Twist Action Ballpoint Pen: Shipsurance provides shipping insurance coverage and selected a promotional pen similar to the Wanda Stylus. The company that covers products that carriers don’t insure, like electronics and computer equipment, showcases its brand on a tech-savvy stylus logo pen that conveys confidence. SLI Systems and the Vitoria Click Action Pen: SLI Systems is all about seamlessly connecting a company’s online and mobile shoppers with products they’re likely to buy. That’s why the Vitoria branded pen is a perfect fit; its comfortable grip, ease of use and absolutely seamless and smooth writing is sure to keep the company on the minds of anyone using this promotional pen. TVPage and the Macaw Retractable Pen: TVPage chose a custom pen similar to the Macaw Retractable Pen, which showcases not only the company’s website, but its logo as well. TVPage is a video commerce network that drives branding and sales, and the Macaw is a great fit with its comfort grip, translucent colors and easy click use. Wpromote and the Radiant Pen with Rubber Grip: A company like Wpromote prides itself on being different while raising rankings, conversions and getting results. The Radiant promo pen is a great fit, with its unusual white clip and comfortable grip standing out against the bright and dramatic color options. Conveyorware and the Belize Retractable Ballpoint Pen: Conveyorware, all-in-one business distribution software, keeps things streamlined and easy – much like the Belize Retractable logo pen. This branded promo pen features an ergonomic gripper, sturdy clip for easy storage and an easy click top set on vibrant translucent color options. Rand Marketing and the Custom Logo Two Tone Basix Retractable Pen: Providing website design, web development, programming and online marketing, Rand selected the Two Tone Basix promotional pen, which offers elegant and comfortable design along with smooth-flowing and long-lasting ink. Much like the company on the barrel, this pen belongs in the spotlight. BluePay and the Dart Pen with Plunger Action: BluePay, a payment processing company that streamlines B2B and B2C payments, picked the Dart Pen with Plunger. This promo logo pen is sleek and streamlined, just like the company it represents. The plastic, dart-shaped writing instrument offers smooth writing, multiple colors and ease of use. UPS i-parcel and the Orlando White Barrel Click Pen: UPS i-parcel offers streamlined, low-cost international delivery for ecommerce parcels, so choosing the streamlined and affordable Orlando promotional pen is a no-brainer. 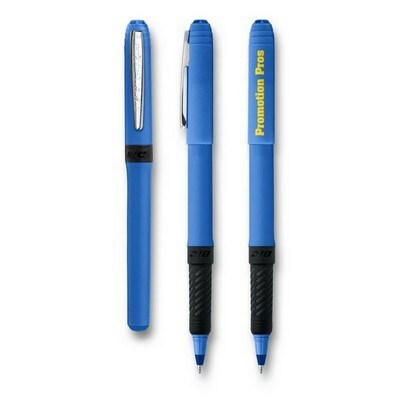 This simple branded writing instrument is fast and efficient – just like the company it represents. Qubit and the Bellair Pen with Rubber Grip: Qubit is a marketing company that prides itself on being straightforward and functional – making its choice of a promo pen similar to the Bellair a perfect fit. 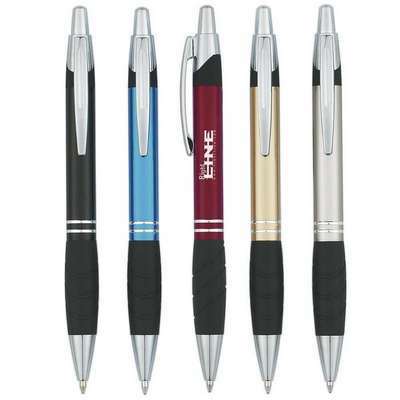 This slim, sleek and attractive pen offers great functionality in a classy package with an ergonomic rubber gripper. Opinionlab and the Pendant Pen with Rubber Grip: Opinionlab, which optimizes experience and drives engagement by gathering customer feedback, selected the Pendant branded logo pen. Made of aluminum, this sturdy promo pen features an ergonomic grip and easy-to-use plunger action. Its functionality, along with its strong appearance, reflects the reliability of a company like Opinionlab. 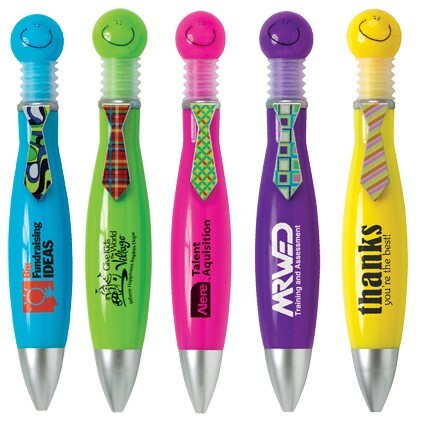 Custom branded pens can represent a company and convey a variety of brands and the office culture. If you’re ready to gather new clients and showcase your company in an affordable and functional manner, check out our promotional pen offerings and start growing your business today! In order to make the most of your booth at a convention or trade show, you’ll want to keep a few things in mind. Here are a few suggestions on how to be successful at conventions. Have a clear idea of your company’s goals, whether to introduce a new product or expand your email list. Consider the venue’s layout and seek out the best location for your booth. Prime spots often sell out early, so plan accordingly. When you decide on the perfect spot for your booth, make sure your brand is seen – and remembered. Attract visitors by clearly identifying your company with colorful tents, tables and flags placed near your booth. People learn in a variety of ways, including visual, audio, and more. Make sure you have options available for each type of learner, i.e. : demo of products, reading materials, video. Have plenty of knowledgeable staff on-hand to answer questions. You can even hire a host to welcome attendees and guide them to appropriate staff members. But be sure everyone involved is clearly identified with name badges or ID holders with your company name and logo. Offer discounts for those who purchase at your booth during the show. Hold a raffle or contest for a great prize to those who come by and sign up to receive email – a great way to build your email list. You can also interact with those on social media who have checked in at the convention, inviting them to your booth to get a special gift or specific discount. But let’s be honest. It’s all about the swag. Make sure you have appropriate promo items to give away to attendees. Your giveaways should be relevant to your industry, useful to the consumer and able to create long-term brand recognition. Anyone involved in education knows you can never have enough pens, pencils and highlighter sets. There’s also always a need for art supplies like crayons and colored pencils. Or how about bags to tote around all those classroom supplies? Not only are they functional, they’re sure to be used and seen over and over again. The automotive industry is full of people who love cars, appreciate car accessories and who aren’t afraid to get their hands dirty. You can appeal to and satisfy all three with a variety of promotional products including safety kits, personalized key chains, auto tools like tire gauges, and trunk organizers. Those in the corporate and business world often sit at desks or travel. 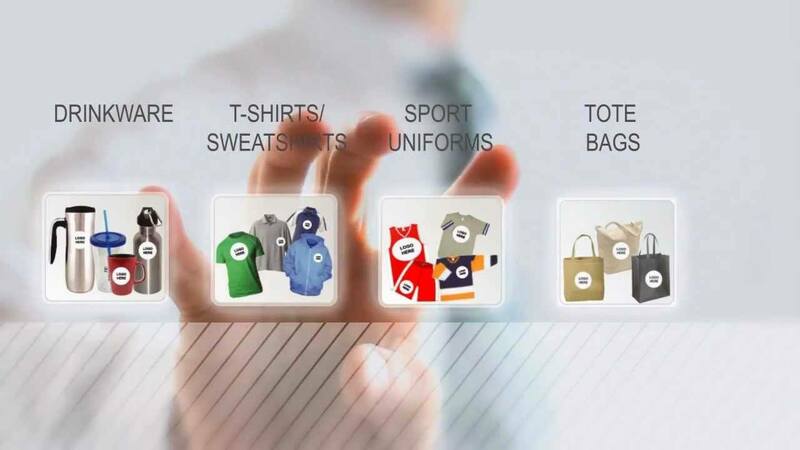 They appreciate functional swag that can help them get organized like desk accessories and binders. Since they tend to travel for business, tech gadgets are a great option: think phone chargers and USB hubs. Promoting a healthy lifestyle is important for anyone involved in the fitness arena. 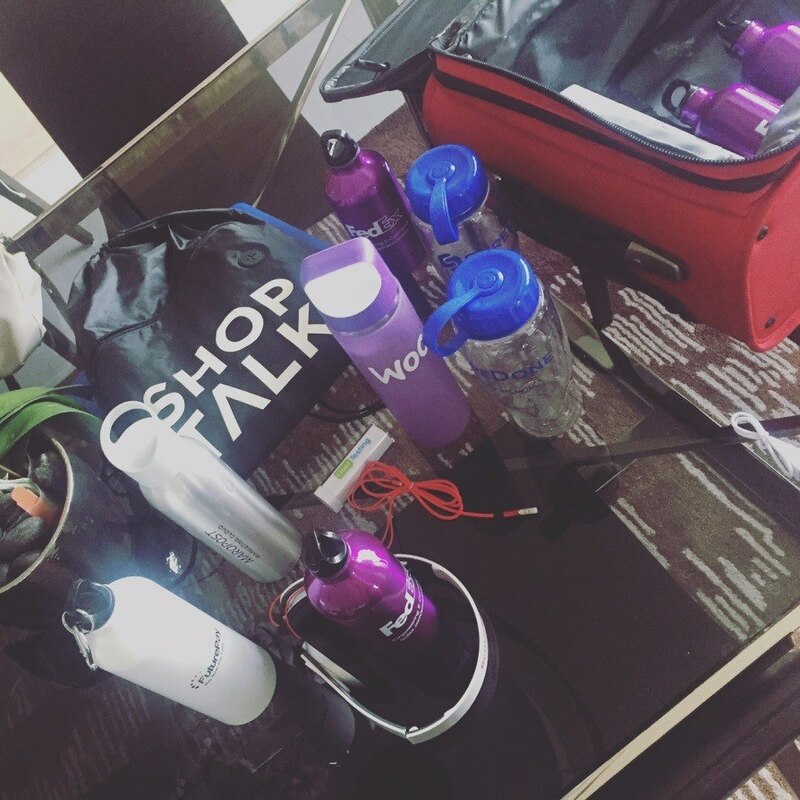 Ideal promo giveaways include activity trackers, exercise bands and yoga mats. And don’t forget to stay hydrated with water bottles. The key to a successful convention is to be prepared, be friendly and, perhaps most of all, have fun! Remember, if you have confidence in your company, you don’t need to sell it. Simply be present and honest – and it will sell itself. We grabbed lots of promotional products at IRCE 2016 – if you see our booth at any future conventions, feel free to drop by and talk to us about how we can help your company.